Last week, I learnt with sadness about the passing of Harper Lee. Her book To Kill a Mockingbird is a favorite of mine and is, in my opinion, one of the best American classics. 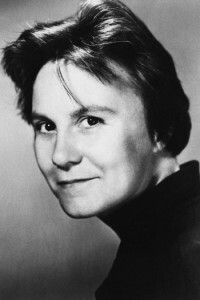 Born Nelle Harper Lee on 28 April 1926 in Monroeville, Alabama, she was the youngest of 4 children. Her father was a lawyer, perhaps the inspiration for Atticus Finch. Her mother suffered from mental illness, and it couldn’t have been an easy childhood for the author. In addition, as Harper Lee was a tomboy, she had few friends as she didn’t have the same interests as other girls her age. That’s probably one of the reasons why she became best friend with her neighbor Truman Capote, another outsider. Later on, she studied law at the University of Alabama. In 1949, she decided to drop out in order to write and moved to New York City. She worked as an airline ticket clerk to pay the bills and hung out with Truman Capote who had also relocated there. In fact, she helped him with his research for In Cold Blood. In 1960, she published To Kill a Mockingbird, and it won the Pulitzer Prize for fiction in 1961. The film adaptation of the book came out in 1962 and won 3 Oscars. Harper Lee rarely granted interviews and led a quiet life. Never married, she lived in a modest apartment in New York where she traveled by bus. She mostly used her money to make anonymous charitable donations. In 2007, she received the Presidential Medal of Freedom. However, she suffered a stroke that same year and had to move into an assisted living facility in Monroeville. In 2015, Go Set a Watchman was published. The author died peacefully in her sleep on 19 February 2016.